This article is about the department in France. For the river, see Meuse (river). For other uses, see Meuse (disambiguation). 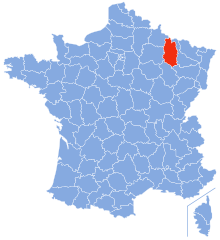 Meuse is a department found in the east of France in the Grand Est region. Its prefecture is Bar-le-Duc. Its population is about 193,000 (2006 estimation). It is one of the 83 first French departments made during the French revolution. This page was last changed on 12 September 2018, at 05:03.